The bitter taste of low quality lasts longer than the sweetness of low price. "The bitter taste of poor quality lasts longer than the sweetness of low price." 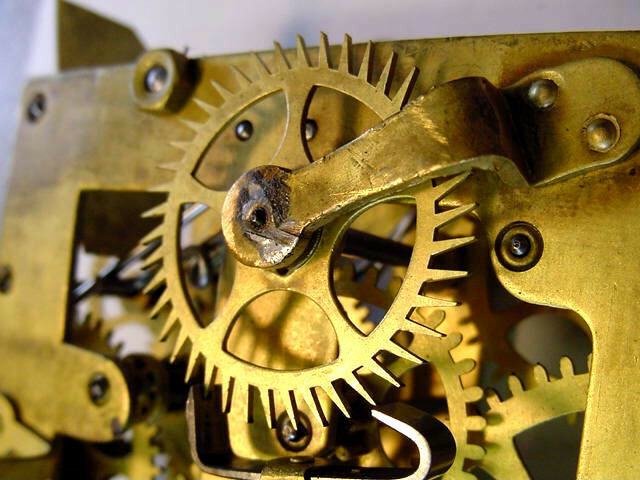 Many people take up clock repair as a “logical” extension of their hobby of antique clock collecting and because it is a hobby charge very little for their work. Because of this, the clock repair trade probably has the largest percentage of untrained, unqualified people of any professional field. 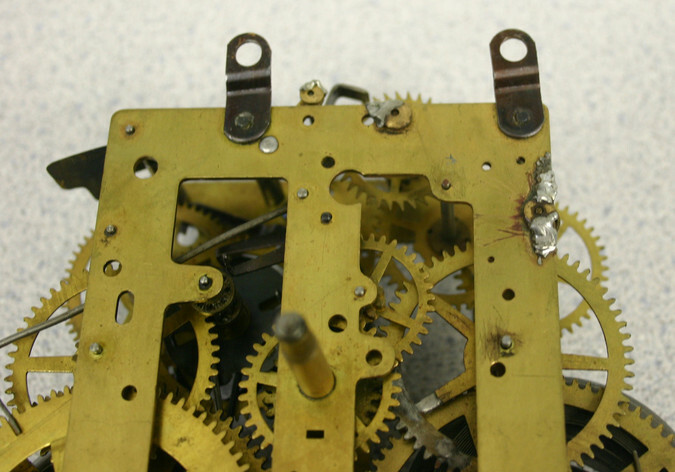 There are also a large number of people who practice clock repair professionally but have never bothered to receive proper training and have therefore developed many bad repair habits. The pictures that follow are proof that ugly, improper repair work is alive and well in Central-Ohio and through out the world. All of the bad repairs you are about to see I have photographed personally. Come; follow me as I take you on a guided tour through the Hall of Shame. This is one of the most egregious bad repairs I have ever seen. 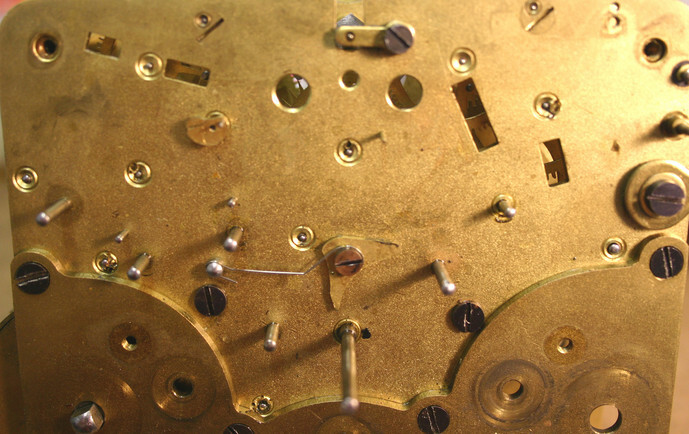 Not because the repair itself is so disgusting (it is) but because of the type and value of clock it was performed on. This Dutch clock, made in the 1700's was sold to one of my customers by an upscale antique store in a large city outside of Ohio. The clock sold for $50,000. Yes, that's right, $50,000! Once the clock arrived it did not function so I was called out to have a look. The new owner had been told that the clock had been completely restored before purchase. 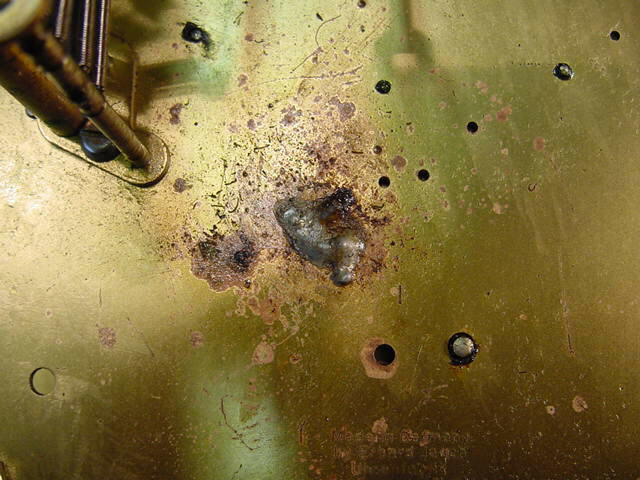 Looking at the brass lever on the right you can see three different points where the lever had broken and been repaired very poorly with solder. To the right of that lever is a steel lever and someone folded up a piece of sheet brass and soldered it around the point where it engages with the rack (sawtooth looking lever) below. There were other problems inside the movement as well. What was most shocking was that the antique store owner was not willing to perform a proper repair to make it right and the clock was returned for a refund. The more a clock runs, the more a clock wears. 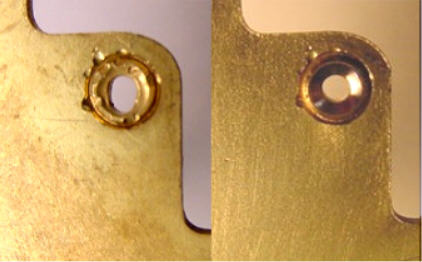 Although proper maintenance slows the wear process, wear is inevitable and will eventually cause all clocks to fail. 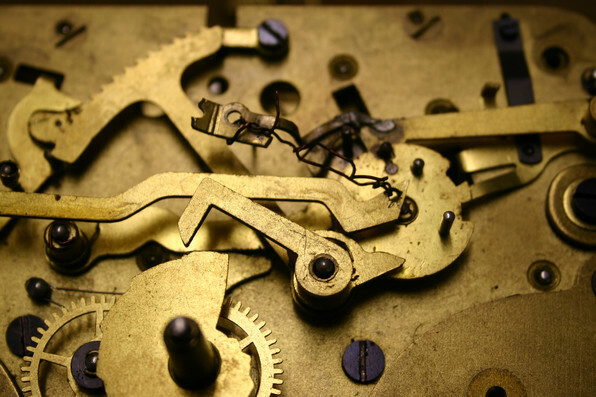 When the clock wears out it must be overhauled or restored. Wear occurs due to friction which is caused by the turning of steel pivots (think of an axle) in bearing surfaces (holes in the mechanism’s brass plates). 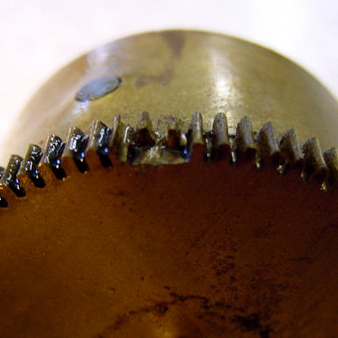 Friction increases when there is a lack of lubrication and the bearing surface becomes dirty. Because the steel is harder than the brass, the brass “hole” becomes elongated or egg shaped. 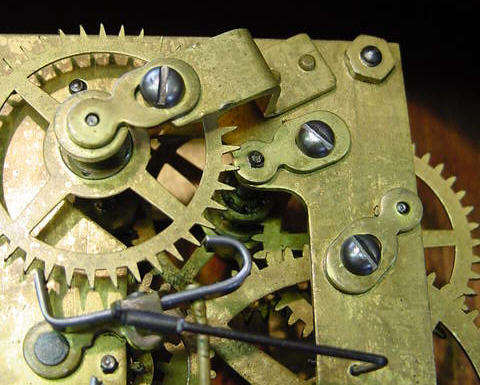 This elongation of the bearing surface causes the gear to shift inside the clock mechanism and leads to an improper meshing of the gear teeth. The improper mesh increases friction and creates drag on the gear train which in turn causes the mechanism to fail. 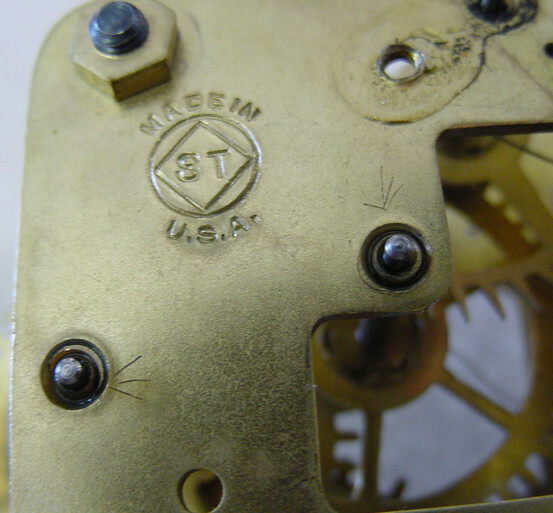 In the middle of the picture we can see the steel pivot protruding through the hole in the clock plate. The dark crescent shape underneath the pivot is the worn area. This darker portion is where the pivot originally turned. The force of the gear next to it has caused the bearing surface to wear upward and away from its original center. In order to try to correct this, the method of prick punching was used. 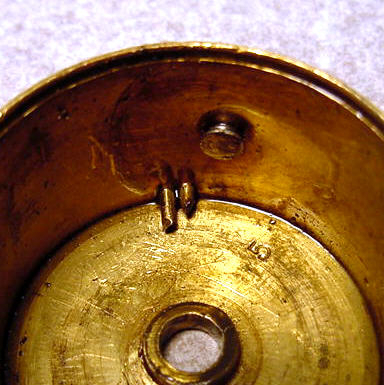 Because brass is relatively soft, using a hammer and pointed metal punch, the brass can be moved slightly reducing the size of the elongated hole and hopefully pushing the pivot back towards its original center. Bearing surfaces are supposed to be round and smooth. I am quite confident that you can tell that this method will never produce a round smooth bearing surface and it is ugly as well. Here is another example. If you look closely you can see that the pivot itself has been damaged by the punch causing it to have a very irregular surface. On the right is the same hole after being properly repaired with a bushing installed. The bushing has taken away most of the prick marks but you can still see some of the them around the outside of the bushing. 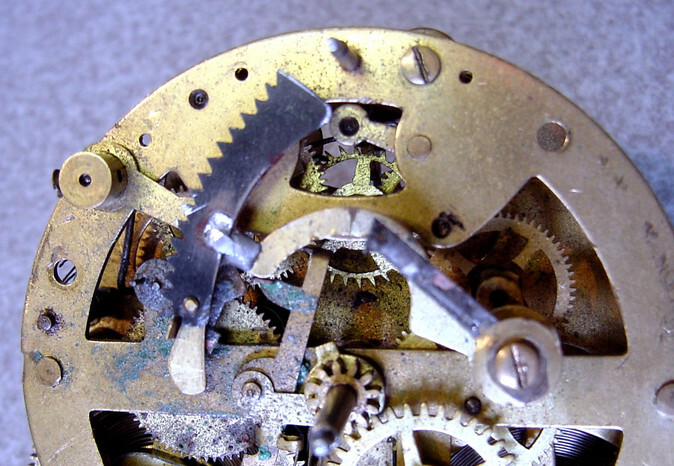 This is why prick punching is such an ugly repair, especially on nice antique movements. 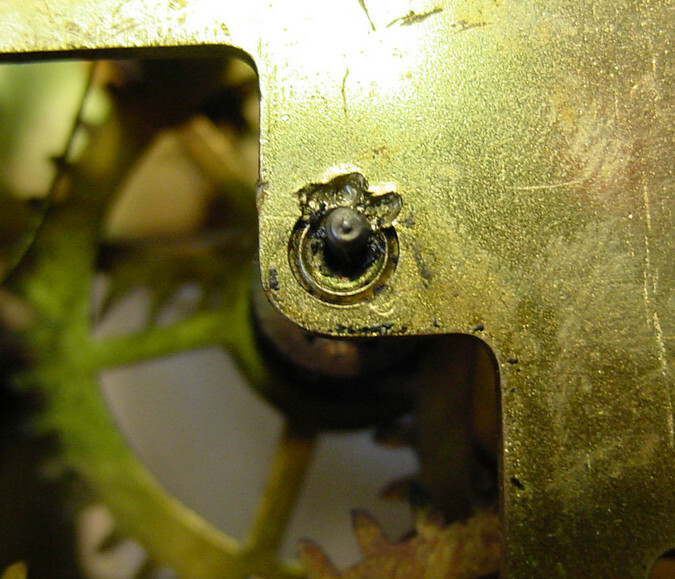 The band-aid bushings are the three pieces under the slotted steel screws holding them to the clock plate. You can see where their name comes from. Remember that wear causes an elongated hole that moves the pivot away from its original center. 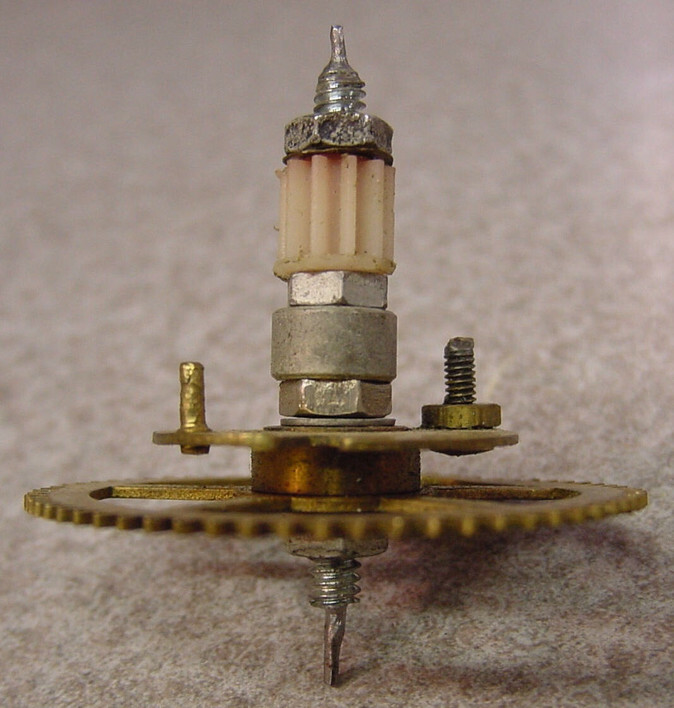 These “bushings” enable a “repairman” to move the pivot back to center without dismantling the clock. Although this method saves time like the others it does not make for a proper long-term repair. 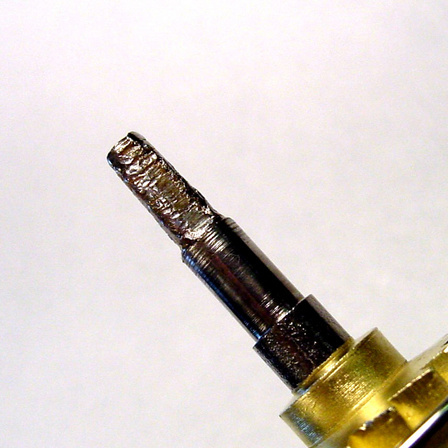 The unpolished scarred pivot surface will typically chew up the new screw-in bushing in a relatively short time. 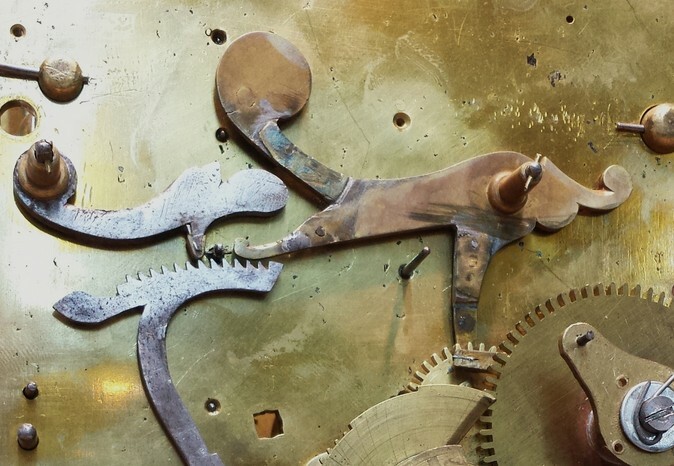 With the exception of perhaps this last picture the one thing all the preceding pictures have in common is that an attempt was made to repair the worn clock without dismantling it. 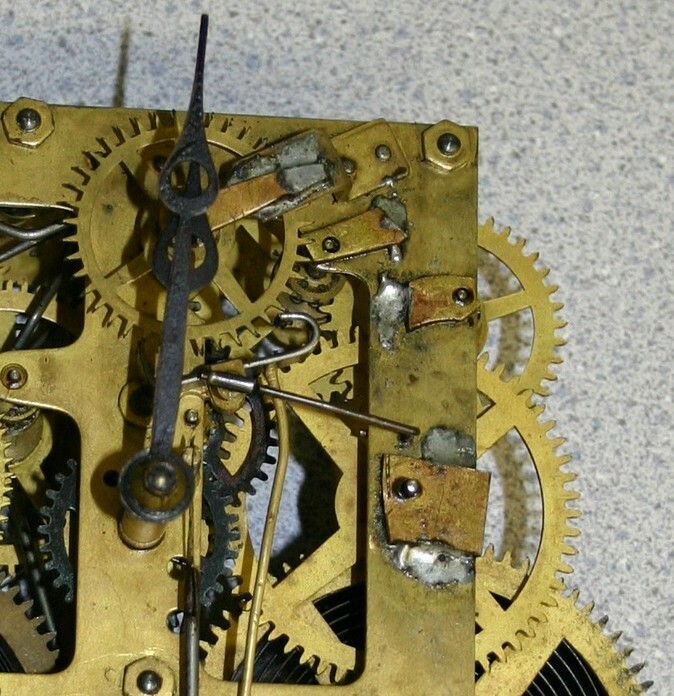 It is practically impossible to do this without defacing the clock and rarely results in a durable repair. Pretty isn’t it! 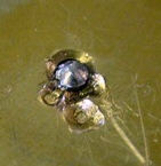 The dark spot just above and to the right of the solder blob is a pivot. I am not sure what this person had in mind here except they obviously did not have a clue as to what they were doing. 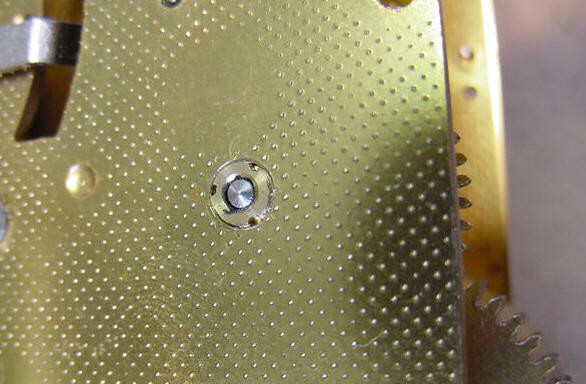 The discoloration of the brass plate is typically caused by flux, which is used to prepare an area to be soldered. After the soldering is done the area must be cleaned or this type of discoloration will only make the idiotic repair look even worse. Okay, here is a new one. This is kind of hard to see in the picture but this "repairman" actually took a small thin piece of brass, bent it over to a right angle, inserted one end into the elongated bearing surface moving the pivot back where it belongs and then soldering it in place. Like the previous picture the soldered area was not cleaned up afterward. The flux has actually caused the steel pivot to rust. Beautiful! This type of repair is bound to last a long time.......not! Does this need any explanation? This movement was a disaster, almost beyond repair. 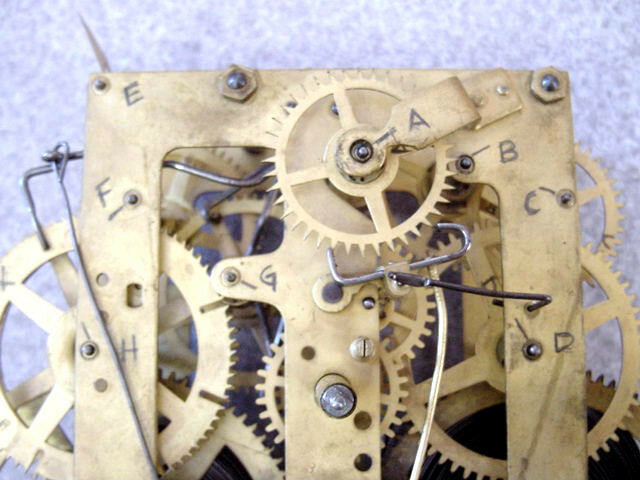 In fact, the cost of repairing this mess got so high the customer did not allow me to restore the entire movement. Rust and corrosion had practically eaten its way through one of the gear arbors. The previous repairman had soldered a new piece onto the striking rack, soldered a new tail onto the rack hook and it even looks like it was done without removing the parts from the movement as the steel parts immediately surrounding this area were all rusted and corroded. This was all a bad idea to start with but he could have at least cleaned up after himself and saved the movement from even more destruction. 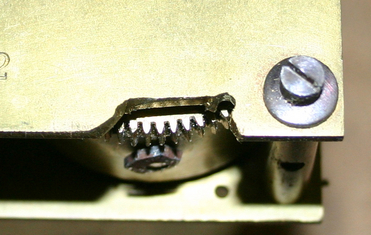 Here you can see the two pins intruding upon the space where the mainspring is held. 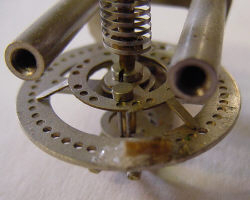 In order to regulate floating balance style escapements it is sometimes necessary to add or subtract weight from the balance wheel. 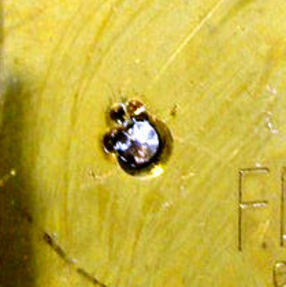 Because this person did not have the proper weight that fits into the small holes you see he thought that perhaps a piece of toothpick and some glue would do the trick. 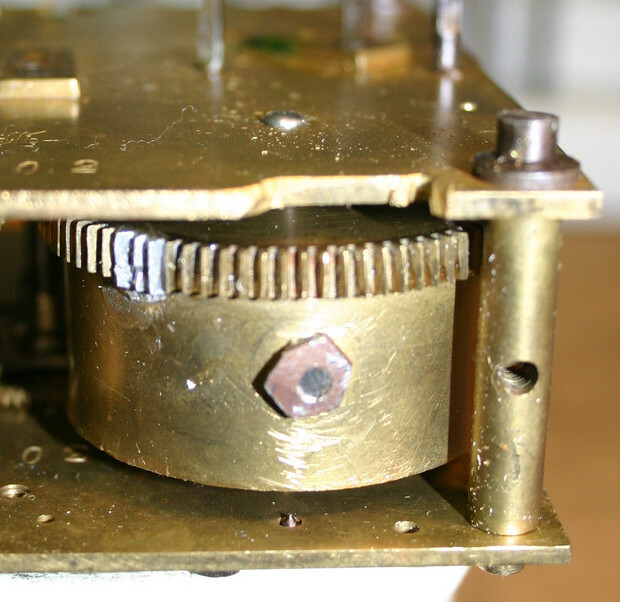 Another view of the chunk cut out of the movement plate.